I love both fabrics but I would say the first one as it is 4 yards. I'm tall and the more yardage the better. I would make a maxi dress or skirt for summer. I haven't worked with silk a lot. I have a lovely blend sitting on the shelf that I'm too scared to cut in to. What a fantastic giveaway! I love the darker fabric, just gorgeous! Ooooh, this is a great giveaway! The fabrics are both lovely and I especially like the first one. I would probably make a skirt or dress. I usually sew with cotton, so silk would be something new. Ooh I like both but peach is a good color on me. I have sewn with synthetic silk before and I'm sure the real stuff can't be any harder than the slippery synthetic.. Thanks for the neat story and the lovely giveaway! Oh pretty fabrics! Thank you for such a generous give away! Oh my, I think the first one I'm more drawn to and I'm imagining it inside a Chanel inspired cardigan jacket. That is fantastic fabric! I would love the first one for a swirly summer dress. If there are odd bits leftover (aren't there always!) I'd use them for a lingerie set, they are my latest obsession! They are both so beautiful. I'd make silk blouses for sure. I wear them all the time. For myself, I'd keep one from the darker color, and the others I'd make for my mother and sister. Thanks for the chance! Nice giveaway! - I would love the 1st one - the lighter peachy color. feb 22, was my 66 birthday. What a great gift either one of these beautiful silks would make. I'm thinking either a shirt dress, or a skirt-shirt combo. Good luck and congrads to whom ever. That's so wonderful that you are willing to share these lovely pieces with wonderful history. I have sewn a fair bit of silk and each time swear that I will do so even more often! I'd love to make the first into a dress. If it was the first one, I'd make a full-skirted dress. If it was the second one, probably a dress as well if I can squeeze it out of it, otherwise a floaty skirt I think. I loooove the second one! That calligraphy-looking signs are just so beautiful! Maybe a dramatic maxi-skirt? Thank you for your generosity. Ooh - Thai silk, how can you go wrong? lol. I love the peach one - it would make a really pretty dress for a nice occasion I think. Something drapey and flowy. Both fabrics are great. I think I'd go with the first one as it might be easier to work with. I'm hosting a giveaway too if you are interested. Thanks for the giveaway! I'd love to try a jump-suit or maxi dress, or maybe a matching skirt/dress for my daughter and I with the four yards. But I also like the Thai character-ish aspects on the second fabric (I have several friends in Thailand, Japan, and China) so I could see making a sleeveless top from that fabric. Hard to choose! I've got a giveaway on my blog as well be sure to stop by! I would love the first one. 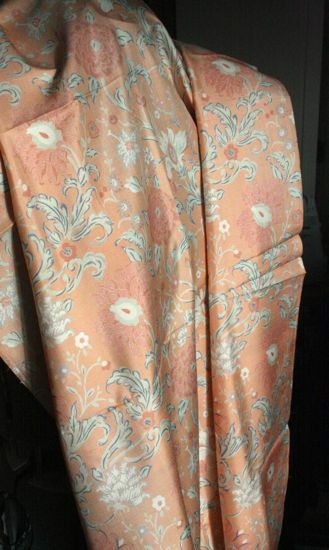 I'd probably use it to make a kimono jacket. Thanks for the opportunity! Oooh I love the dashes of pinks and purples and blues in the second one. It speaks maxi dress to me. 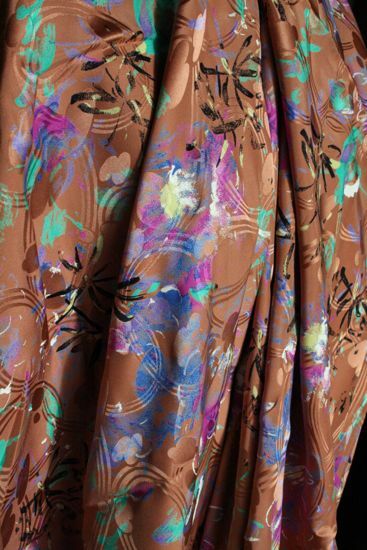 I have not had the good fortune of sewing with real silk, however, I love these two prints. I love the first one, I would make a dress with a box pleated skirt. Mind you I wouldn't say no to the second one either. Oh beautiful fabric! The first one is just lovely but I prefer the second. I think it would make a great summer skirt, long and drapey. Haven't worked with silk before so that would be a fun challenge.